I've noticed during the live streaming that many of the courts look a lot different from the past. Does anyone have a summary of all the improvements and renovations that have been made for this year? I would assume the best articles are in French. They have three new courts: Court 7 and 9 (replacing the old courts 7, 9 and 11) and court 18, a big showcourt at the far western end of the area. It's quite obvious that they are trying to copy Pietrangeli there. Court 2 is not in use anymore. Thanks for your reply I think the new Court 7 is what really caught my attention. The huge metallic wall in the background is kinda strange looking and reminds me of Madrid. Has the Bull Ring been demolished yet? I know it will be eventually in order for a new public garden area similar to Henman Hill. About time they invested a little in the venue, it hadn't changed at all since I first went in 2005. Not yet, I think they will demolish it when the new court one is in use, most probably in 2019. After this year's tournament, which runs from May 27-June 10, 80 percent of Philippe Chatrier will be destroyed. "It is one of our biggest challenges," Gilles Jourdan, director of the expansion project, told Reuters. "The stands of the Centre Court will be destroyed so they can be rebuilt next spring and be ready for 2019." A little further on, work on Court Simonne Mathieu is almost complete. 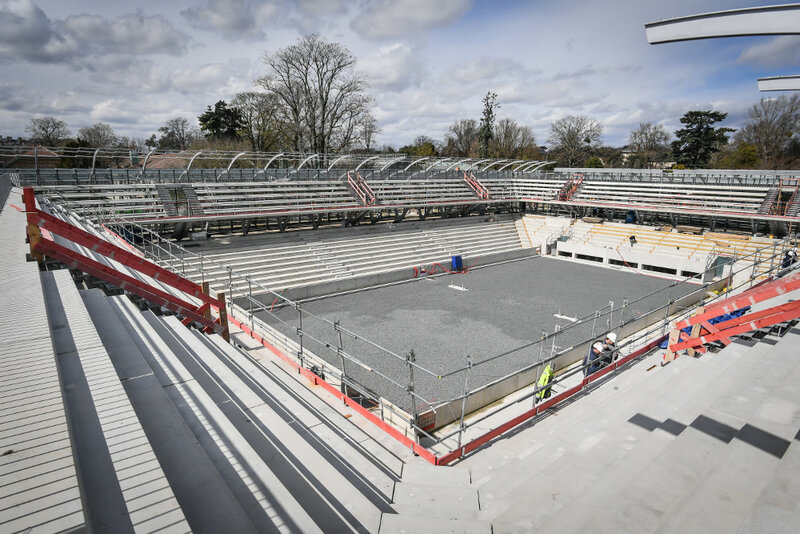 Named after France's second-most decorated female player, the arena will replace Court One, the stadium's third-largest court, affectionately known as the "Bullring" because of its shape and atmosphere. The Bullring's 5,000-seater replacement will be nestled among the area's graceful 19-century greenhouses, and will be ready in time for the 2020 tournament. Court One will be demolished only after the 2019 French Open, and Giudicelli plans to allow supporters with a general access pass into the Bullring next year to give them an opportunity to bid adieu to the arena. Last edited by RobertJon; May 22nd, 2018 at 03:24 PM. Are they gonna tear the venue down with the crowd in it? It is sad to be losing such an iconic venue, but I have a feeling that the new court 18 will eventually become iconic. Are there any facilities like food and toilets by the New 18 ??? so what happened to 2/3 ? destroyed? or Court 3 still in use? Court 3 is still in use, Court 2 not. Strange to see such a small stadium with two tiers It also doesn't look like there will be a lot of room at the back for players to return from deep in the court.